This is a work in progress, I hope to have it completed tomorrow. 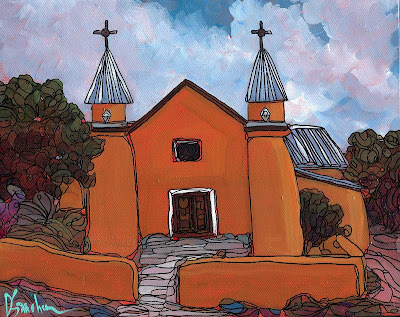 I should also be finished tomorrow with my commission of the Abiquiu church. And on Tuesday, guess where I'm going? 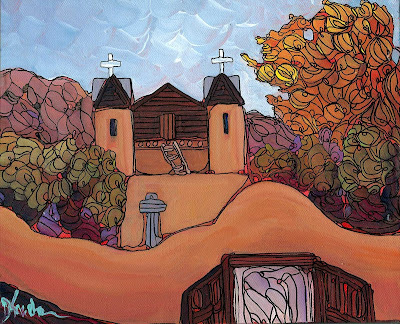 Santuario de Chimayo, the beautiful church that I've painted so often! I think it's been about 9 years since I've actually been there. I'm not taking paints, just going on a day trip, but I am taking my camera - for photos and maybe a video or two. I'm sure some of those photos will become paintings for Artfest. Enjoy your Labor Day! 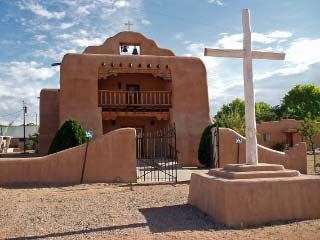 This is a photo of the church in Abiquiu. 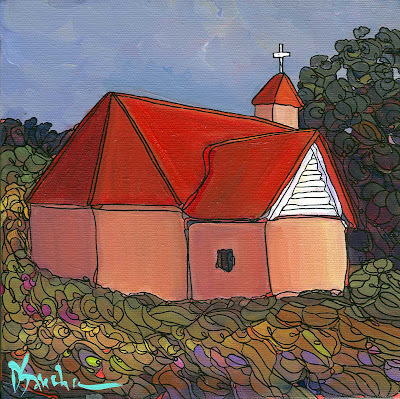 I'm working on a painting for someone right now of this beautiful church, which I WISH I had seen in person (that's my next trip - that and Chimayo). I ran errands ALL day today and came home too tired to do anything, although I did make sure I rode the bike for 25 minutes and applied ice to my knees. 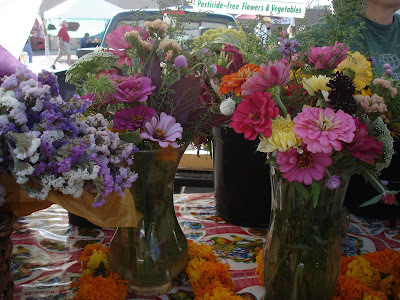 I am getting up really early tomorrow to go to the Farmer's Market and see what goodies I can find. 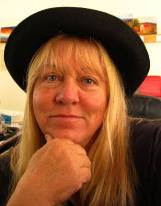 I also hope to clean my studio, finish up two paintings over the weekend, and do a little "playing" (what my favorite cousin and I call driving around looking at houses, antique stores and whatever else we can find). Then on Monday I start painting nonstop for Weems Artfest. I will try my best to slip in a daily painting as often as possible. 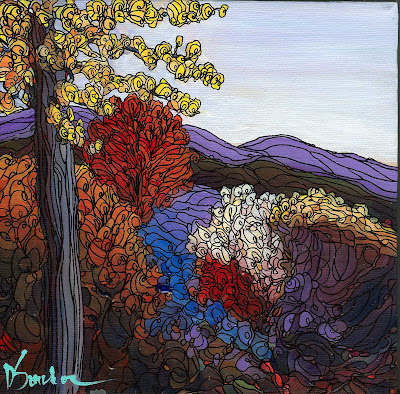 I'll be sure to show some of those Artfest paintings from start to finish, so you will get a good look at my process. Also, my painting for the Balloon Fiesta was picked up today. 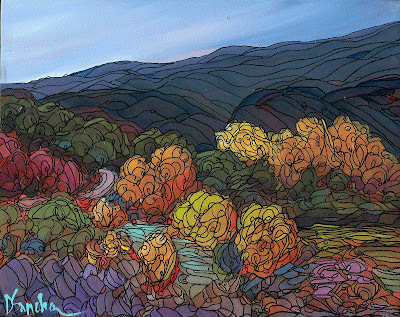 They will be selling giclees (basically really nice prints on canvas) of the painting at Balloon Fiesta park all during the Fiesta. They will be $25. If any of you would like one, let me know, because we're trying to figure out a way that I can also sell them from my blogsite. We've had a couple of cool mornings here, which leads me to believe that fall might just be around the corner...hopefully. I always think of northern New Mexico at this time and can't wait for the aspens to turn that beautiful golden color. 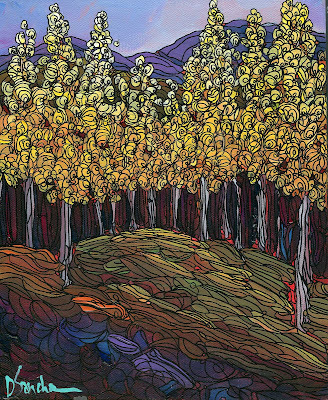 I don't paint aspens very often. I've done a few in my daily paintings and I usually paint one large painting for every show I do. The lining on the trees is intensive, let me tell you. A 40x30 painting takes weeks. I hope you enjoy. 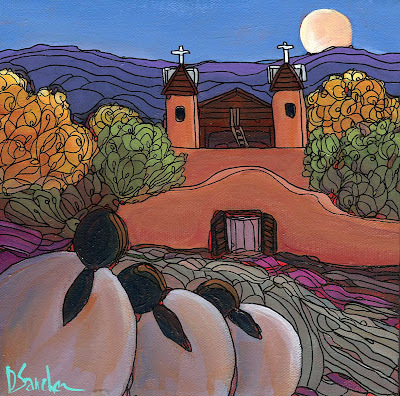 Tomorrow I will be posting a finished commission of the little church in Abiquiu, NM, where the renowned artist Georgia O'Keefe lived and painted. 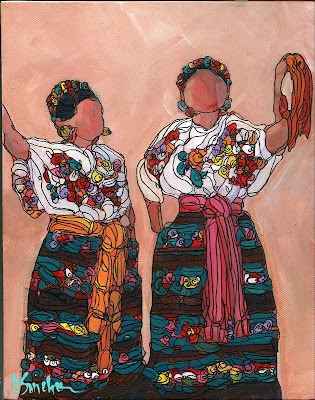 This is the next painting in my series of folklorico dancers. This dancer was walking at the state fair and just twirling away to the music! It's finally done. I love it. 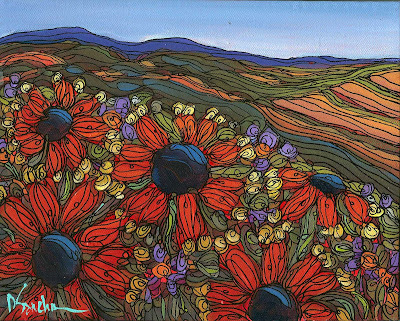 I think it's whimsical, playful, colorful, and it shows a lot of New Mexico: the Rio Grande River, chamisa, cottonwoods, sunflowers, the Gazebo at Old Town, the Hyatt Hotels downtown, the Sandia Pueblo, the Sandia Mountains, a beautiful valley landing-take off field, and our starry New Mexico nights. And balloons! Now I just need a TITLE. Help me out!! 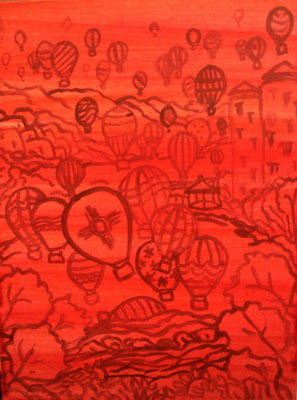 This is a rough sketch for my Balloon Fiesta painting. 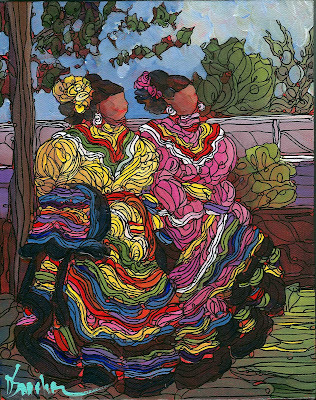 This painting is being purchased by the Balloon Fiesta and made into giclees to sell during the firsta. 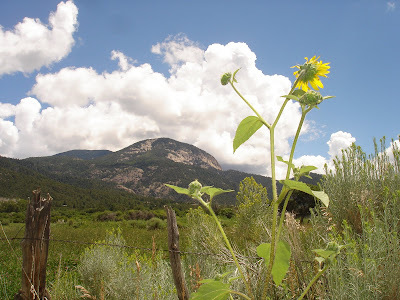 It has a lot of elements in it; flowers, the river, balloons, fields, cottonwoods, the Hyatt hotel downtown, the Sandia Pueblo, the Sandia Mountains, the gazebo at Old Town, an old adobe with Ristras, a moon rise and stars. Wish me luck, I think I will need it! The latest in my series of dancers. These dancers are in a park, waiting in the wings to perform. I hope to complete this one tonight. I just thought I would show you the process. Normally, I work all over the painting, making sure it's cohesive and the colors have a nice contrast. 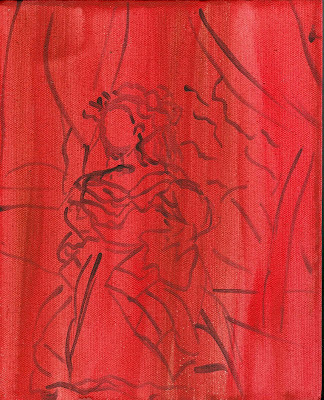 With my dancers, I have been painting the background first and leaving the best for last - the dresses! I love the colors in this piece; soft, muted, and warm. It's from a photo I took in Placitas last October. We've had some rain here the last couple of days and cooler temperatures, so I know fall is just around the corner! I hope you enjoy this one because it came together for me nicely. Tomorrow I have three commissions to finish up and a ballon fiesta painting to complete. 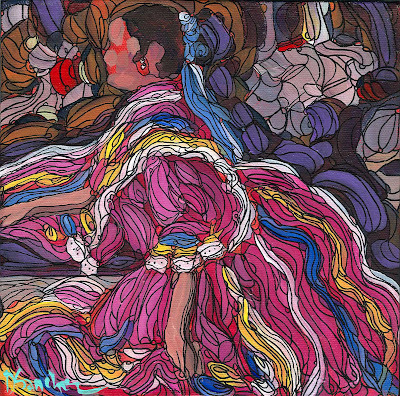 I also have another underpainted folklorico dancer painting. I will finish that and post it tomorrow too. It will be a busy and hopefully, productive Monday. An oil I painted in Taos on my weekend trip. I was sitting out on the patio and these hollyhocks were right up against the adobe wall. I barely got the last brushstroke down and it started pouring rain. I love the immediacy of oil, the thickness, yes, I guess the mess too. 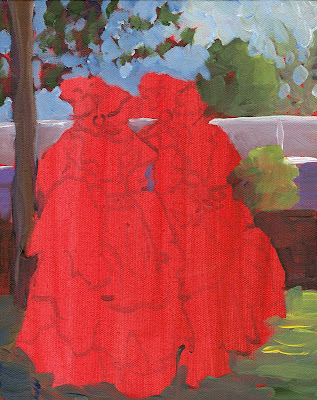 I will be sneaking an oil painting into the blog every so often, just to try to hone my skills. I hope you like it. 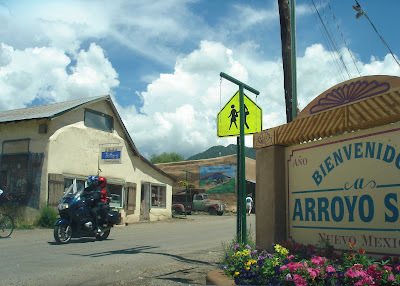 Arroyo Seco: I want to live in this little village! Well, I'm back. I had a nice quiet relaxing weekend. Actually, it was a little too relaxing, all I did was lay around and sleep. It came a huge rainstorm on Saturday, so hard that my brother-in-law's car almost got hit by a big boulder rolling down off the mountain. The air was fresh and cool too. 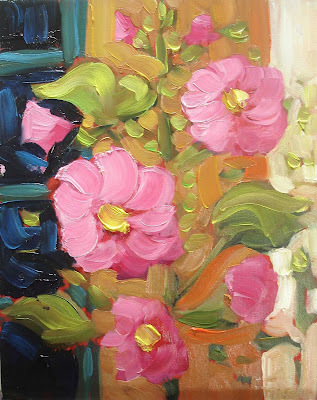 I did one little oil painting of hollyhocks and that was it. Tomorrow I start back to work. I'm trying to exercise in the morning and work in the afternoon. I never can stick to any kind of schedule, but I'm going to try 12pm-5pm and see if I can do it. The artist in me just hates deadlines and anything to do with a schedule. We'll see. I'm going to try to get some daily paintings done this week and then I start painting for Weems Artfest. 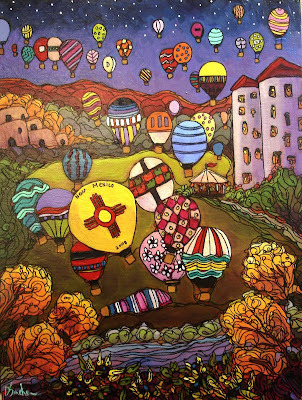 I am also painting an 8x10 for the Albuquerque International Balloon Fiesta that they will make into little giclees and sell. So, it's gonna be a busy week. 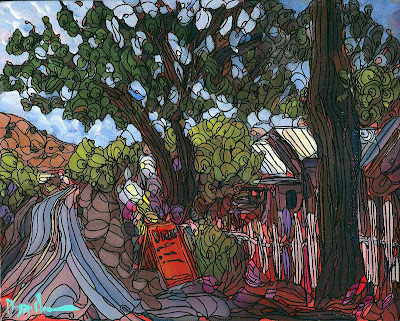 I painted this scene a couple of weeks ago in oil on location in the cool, hip village of Madrid, New Mexico. I also took photos, most of which were pretty spectacular. This one however, was not. It was overexposed and after I printed it, I got paint all over it. BUT, I always think of Madrid as colorful and beautiful - a really fun place to go on a day trip. So, I improvised and embellished. And I consider this acrylic version, "MY MADRID," the real one because this is how I see it. Colorful, kind of like a circus, and somewhere you just go to hang out, shop, and get away for the day. I will not have a new daily painting post until Sunday night or Monday. Enjoy your weekend! I decided to try something a little different! 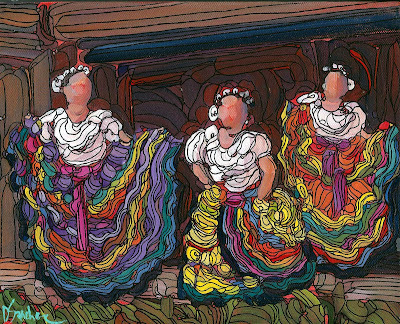 This is a painting of dancers from the Mexican Folklorico group performing at the New Mexico State Fair. 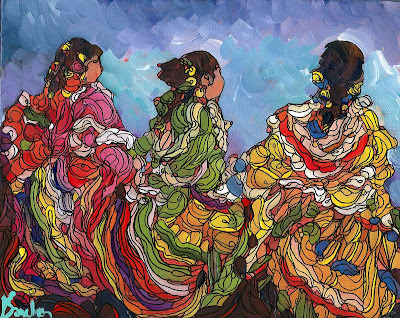 I've always loved their brilliant ruffled costumes and have wanted to paint them for quite some time. I wasn't sure what the finished piece would look like, but I love it. I just painted what I saw, not what I thought they should look like. If there's a request for more, I may paint a whole series! 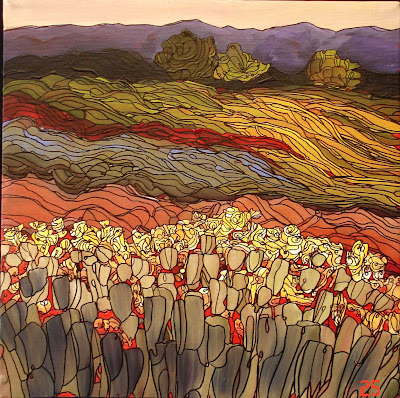 This is painting #2 of "Tribute to a Beautiful Earth," the series we're working on with www.dailypainters.com. I have always felt a deep connection to my Canyon Women. They are simple, I usually paint them in threes, and they are always watching, working, or nurturing. 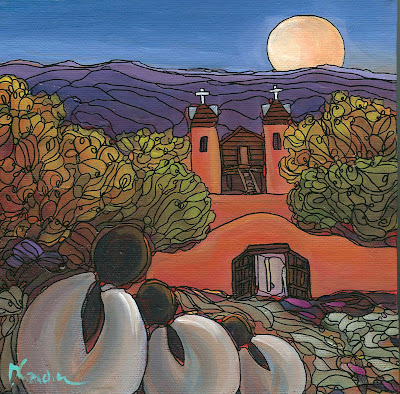 I feel like these women have probably done a good day's work, now they are resting and supporting each other - maybe they have come to the church because it's near their home and when they saw the full moon coming up over the mountains, they just stopped to breathe a moment and take it all in. I know, in my own life, I need to pause every once in a while, stop what I'm doing, and just enjoy our beautiful earth and everything she gives us. I almost forgot about the month-long tribute that we're doing on www.dailypainters.com. 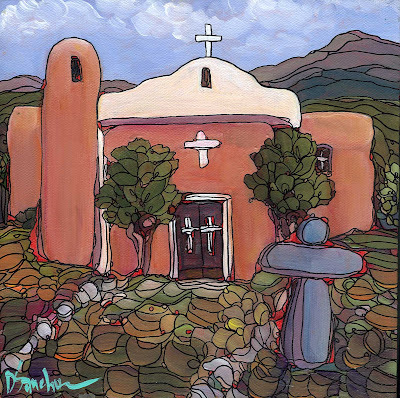 "PAINTING THE LAND OF ENCHANTMENT"
Anyone who lives in Albuquerque - please come on down tonoght and see this wonderful exhibition of 120 paintings painted in plein air by 60 extraordinary artists in 6 days of intensive creativity! I will be there myself at 5pm, so come down and have a look at my plein air work (not my usual style), and day hi! !